The HPE 4Gb Fibre Channel Pass Through Module for c-Class BladeSystem Enables simple direct attach storage for all height c-Class server blades. 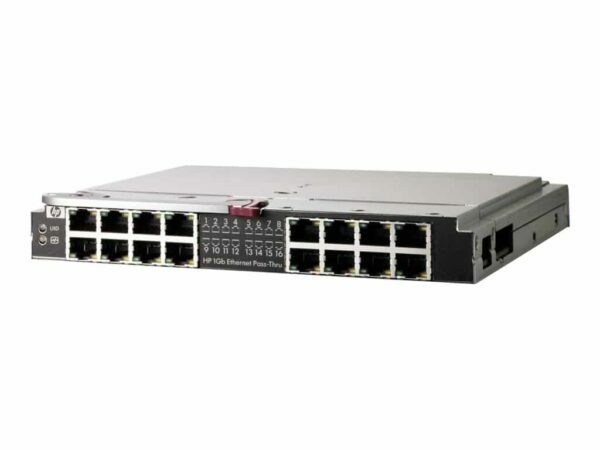 HPE 1Gb Ethernet Pass Thru Module with Gigabit Ethernet x 16 ports in a single bay form factor.1:1 non blocking architecture. The Ethernet Pass-Thru Module is shipped as a single unit and should be ordered in quantities of two. HPE 1Gb Ethernet Pass Thru Module is shipped as a single unit and should be ordered in quantities of two.